﻿Ash Wednesday: Calendar, History, Tweets, Facts, Quotes & Activities. Ash Wednesday is mainly a Catholic observance in which ashes is marked on the forehead of parishioners in the shape of a cross. The ashes are meant as a reminder of our mortality and sinfulness. Ash Wednesday marks the beginning of Lent, a 40 day period (excluding Sundays) that ends with Easter. This is a solemn period observed by prayer, repentance, fasting, and moderation. Sundays are excluded as they are considered a celebratory day that represents the resurrection of Jesus and the Sabbath day of rest. 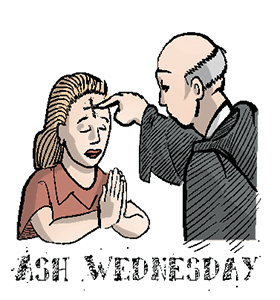 Ashes to ashes, dust to dust is a phrase commonly recited during Ash Wednesday services. It is meant to remind us of our mortality in that we began as dust and our bodies will ultimately return to dust after our death. This phrase originates from Genesis 3:19: ...for dust thou art, and unto dust shalt thou return . Ashes symbolize the dust that we eventually become after are death. This is a reminder us of our mortality and that our time on earth is limited. The day before Ash Wednesday is Mardi Gras. As this is the last day before the start of Lent, it is often accompanied by partying and celebrations. The idea being that it is the last day to indulge before the Lenten period of moderation and repentance. Ash Wednesday is not a holy day of obligation. It is not explicitly in the Bible, however the Bible does record accounts of people in the Old Testament using dust and ashes as symbols and repentance or mourning (Daniel 9:3, Esther 4:1, Job 2:8, 2 Samuel 13:19). Go to your local parish to get ashes and reflect on your own mortality and sinfulness. Non-Christians are also welcome to get ashes. Fast during Ash Wednesday to commemorate Jesus fasting for forty days in the desert. Catholics are specifically instructed to not eat meat and are only permitted to eat one full meal. However they may have 2 snacks in the form of some food in the morning and evening. Make fiber-rich vegetarian versions of popular dishes. Some good ideas are Veggie Burgers, Vegetarian Chili and salads with Tempeh. The fiber will help keep you feeling full - useful if you fast for the rest of the day! Rent a movie that reflects on Mortality or Repentance. Some suggestions age: Les Miserables (2012), Dorian Gray (2009), What Dreams May Come (1998), Flatliners (1990) and The Seventh Seal (1957). Discuss mortality, repentance and the meaning of life with your friends or with a church group.